Wearing tight shoes can be very uncomfortable and painful, especially if they are new. You don’t have to worry anymore, as today we will help you learn how to stretch tight shoes in a simple way. This quick trick works best for leather shoes, but you may try it with other materials like artificial leather. Make sure to repeat the procedure after a while. Take 2 plastic bags with zip-lock as you will need to seal them. Fill ¼ of the bags with water and then place them in the shoes, putting them in the freezer. The water should freeze completely. Take them out of the freezer and leave them for 20 minutes so that ice can melt. 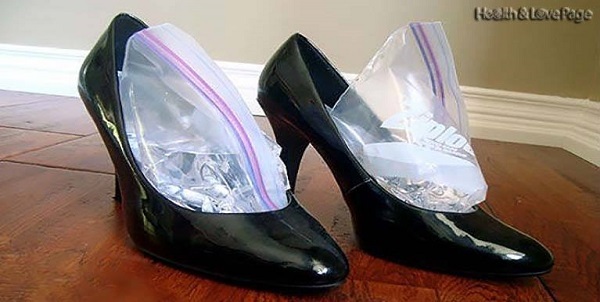 Take the bags out of the shoes and blow them with a hair dryer. This is a fantastic trick which can help you stretch your shoes. You can even expand them to an entire shoe size.